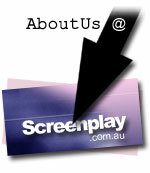 Thanks for visiting the Screenplay.com.au press room. If there's anything you need, or information you can't find, don't hesitate to let us know. NOTE: Our Press page is currently out of date. We aim to have an updated press kit and information online soon. For more current information, please contact Jeff directly. Below is our standard Press Kit, downloadable as a combined press kit, or in individual pieces. Please let us know if you have any additional requests. The following information is currently out of date. We will be releasing new press information soon.